What price freedom? In terms of 3G wireless Internet access, it's about $40 to $60 per month, with a two-year contract. 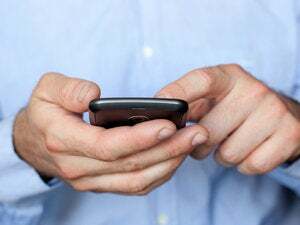 But unlike most other mobile broadband services from U.S. wireless carriers, Virgin Mobile USA's new Broadband2Go service doesn't shackle you while setting you free. You can use the wireless mobile broadband service as needed--no contract required. Despite some set-up difficulty, I found the Broadband2Go service easy to use, mostly reliable, and reasonably fast (depending on location). I recommend it for anyone who needs a mobile broadband connection a few times a month or so but doesn't want to be tied to a data service contract. On June 10, Virgin Mobile USA announced Broadband2Go, a nationwide (U.S.) mobile broadband service offering prepaid, contract-free Internet access using the Sprint data network. To use Broadband2Go, you must first purchase a Virgin Mobile-branded USB modem built by Novatel Wireless. Currently, the compact $150 modem is sold by Best Buy. Broadband2Go isn't the only pay-as-you-go 3G option. Other 3G mobile broadband plans require a one- or two-year commitment and cost $40 per month and up. For example, Novatel Wireless's MiFi device is available from Sprint and Verizon Wireless. If you pay full price for the MiFi ($400), you can then pay $15 per day for unlimited use, with no contract. Otherwise, you must agree to a contract and a monthly data plan ($40 monthly for up to 250BM and $60 monthly for up to 5GB). I didn't have time to set up Broadband2Go before leaving home--something I always recommend doing before trying a new service or product on the road. Unfortunately, installing the modem on my Windows XP-based Samsung N120 didn't go as smoothly as Virgin Mobile USA's instructions described. You're supposed to plug the modem into a USB port, follow a few on-screen prompts, and then you're online. But my netbook didn't recognize the modem and asked me to find the software driver for it. So I called Virgin Mobile's toll-free tech support line. A representative suggested I pop the modem out, wait 30 seconds, and pop it back in. That did the trick, installing both the modem's driver and the Broadband2Go software utility, which you use to connect and disconnect from the 3G data network. But I wasn't done yet. Next, I was unable to get the Broadband2Go software to activate the modem. So I called tech support a second time and asked them to manually activate the device, which resolved the issue. By the way, in both instances, I found the Broadband2Go tech support representatives helpful, knowledgeable, and friendly. Not surprisingly, while I was at Harmony Ridge Lodge, the Broadband2Go network service was slow, because it needed to operate on Sprint's older 1x data network. The connection frequently dropped, too. While it gave me Internet access where I'd otherwise been without it, the experience was frustrating. So I did what I came to the lodge to do in the first place: I disconnected. Back home in San Francisco, I found an unexpected use for Broadband2Go when I took my partner to a hospital (for a minor back injury) to be X-rayed. We were there for hours, and I was on deadline. There were only two Wi-Fi hotspots in the waiting area, both password-protected. I used the Broadband2Go modem and service to get online, so I could get my work done while we waited. The connection was stable and reasonably fast. Later, I used Broadband2Go at home and at a few other spots in San Francisco--including Ocean Beach on a beautiful day--without any difficulty and with good speeds and reliable connections. 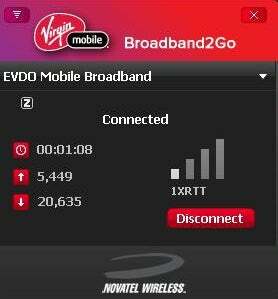 Broadband2Go, like other 3G mobile broadband services, doesn't give you lightning-fast performance. For example, using SpeedTest.net to test speeds, downloads were at 640 kbps and 260 kbps using Broadband2Go on my Samsung netbook. When I connected the netbook to my 802.11n Wi-Fi network at home, however, SpeedTest.net recorded download speeds of 1660 kbps and uploads of 430 kbps. Aside from a more complicated install than I had expected, my only complaint about the Broadband2Go service is the 10-to-30 day expirations tied to Virgin Mobile USA's plans. Why not give customers 90 days (or longer) to use up their data plans? Nonetheless, there are times in every traveler's life when a Wi-Fi hot spot or other type of Internet connection is needed but not available. Or it's not worth the bother of signing up for a pay-per-use Wi-Fi network service for, say, 20 minutes of connectivity, such as when you're trying to work before boarding a flight. If you find yourself in one of those situations with some regularity--but not enough to justify a 3G data service contract--you've finally got a viable option: Virgin Mobile USA's Broadband2Go. Can You Make Do With a Cheap Unlimited Wireless Plan? What Will Chrome Mean for Road Warriors? Google recently announced it's working on the Chrome OS. Among Chrome OS's promises are fast bootup time and strong security, two potential benefits of particular importance to mobile professionals. Review: HTC Touch Pro 2 HTC's new unlocked Touch Pro 2 smartphone ($800) is pricey and, like many Windows Mobile smartphones, pokey when launching apps or scrolling through contacts. But it's a nice change from your typical smartphone and has a clean, modern look. How Much Does It Cost to Own a Smartphone? Smartphones such as Apple's iPhone 3G, which is now only $99, may seem like a good deal up front--but the costs can quickly add up. We did the math, and we discovered that the total cost of ownership over the life of a 2-year contract for a 16GB iPhone 3GS was $159.82 per month, or $3,835.75. Contributing Editor James A. Martin offers tools, tips, and product recommendations to help you make the most of computing on the go. You can follow him on Twitter. Jim is also the co-author of Getting Organized in the Google Era, to be published in March 2010. Sign up to have Mobile Computing e-mailed to you each week.